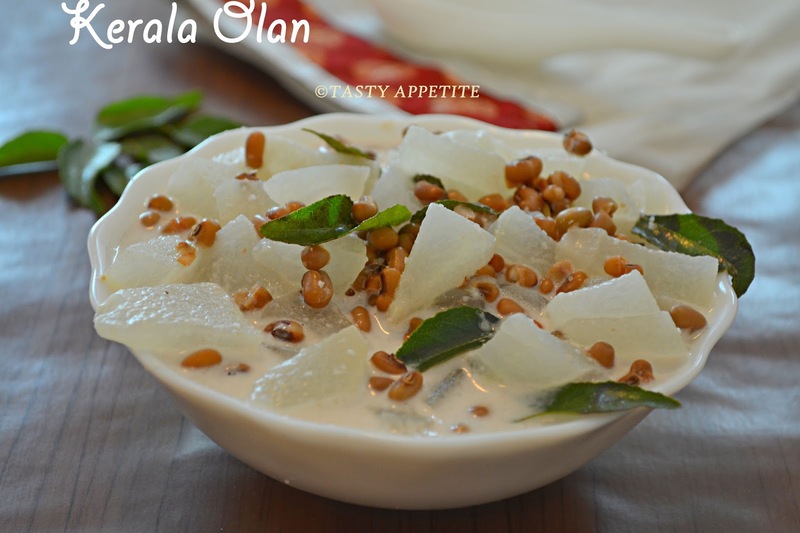 Olan is a traditional Kerala dish and is a must dish during Sadyas, grand festival feast of Kerala. This authentic recipe is so easy to prepare. It is made with coconut milk and ashgourd ( pumpkin can also be added ) as the main ingredients. 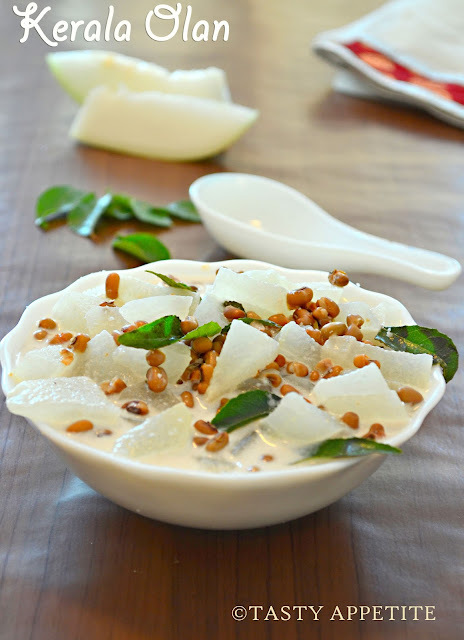 I just love the taste of mild spices and awesome flavor of coconut in this dish. The healthy cowpeas also adds more taste to this simple dish. 1. 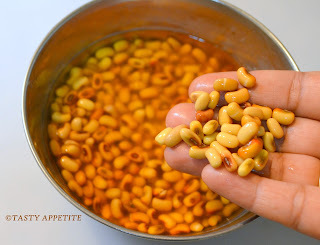 Wash and soak cowpeas for 1 to 2 hrs. 2. Pressure cook with enough water and little salt. 3. Strain the water / stock and keep aside the cooked beans. 4. Take care the beans shouldn’t be overcooked to mushy. It should retain its shape. 5. Grate coconut to small pieces. 6. Take it in a mixer, add little water and grind it to paste. 7. 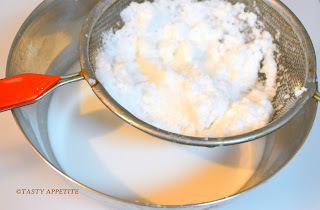 Strain and extract thick coconut milk. 8. Now add again1 cup of water and grind further for a minute. 9. Strain the extract the second / thin coconut milk out of it. 10. Keep both the coconut milk separately in cups. 11. 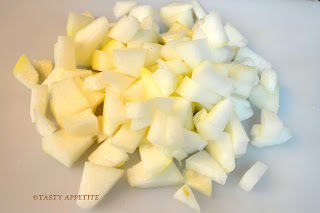 Peel and chop ashgourd into small pieces. 12. Heat a kadai / fry pan. 13. 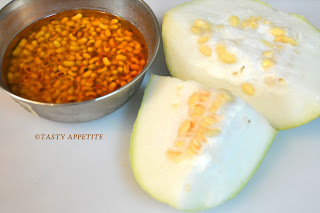 Add the ashgourd pieces, green chilly slit lengthwise and saute for a minute. 14. Add 1 cup of thin / second coconut milk and cook the veg covered. 15. Keep the flame in medium low, and stir once in a while. 16. 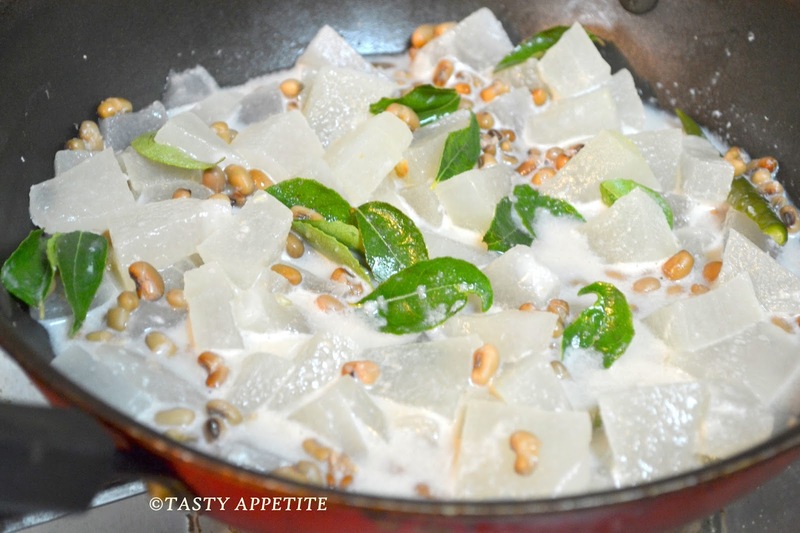 Once the ashgourd is tender ( take care, ashgourd also should not be overcooked ) add the cooked beans. 18. Now add the thick ( first ) coconut milk and fresh curry leaves. 19. 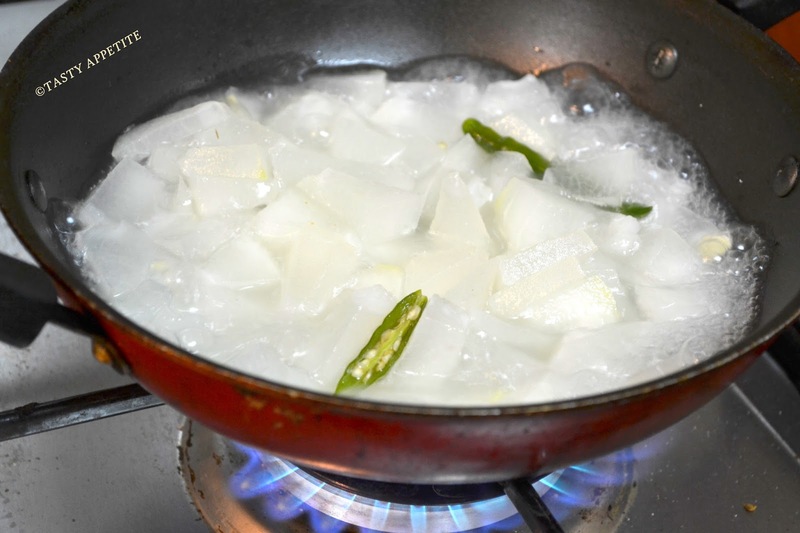 Simmer the flame and allow to cook for 3 to 5 mins. 21. Drizzle 1 to 2 tsp of coconut oil on top. 22. 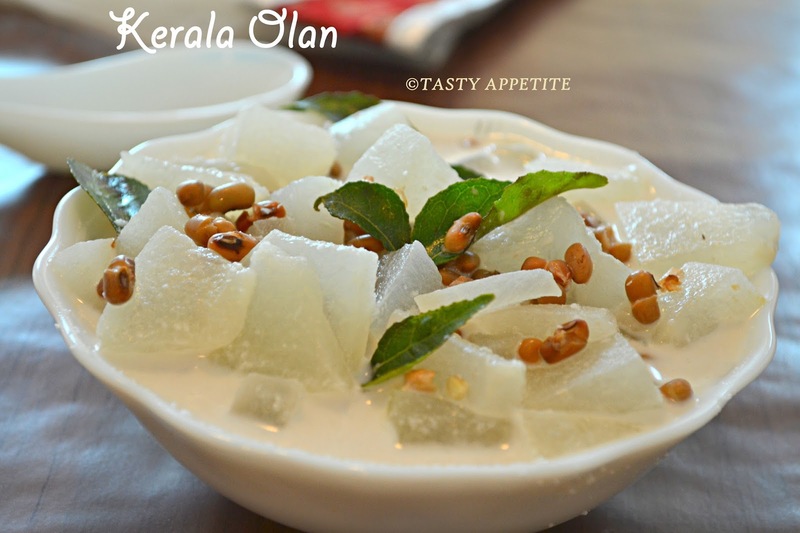 Authentic and delicious Olan is ready. 23. Olan goes well with steamed rice and pappad. Very comforting and delightful olan. Loved it. Happy onam. Awesome Olan. 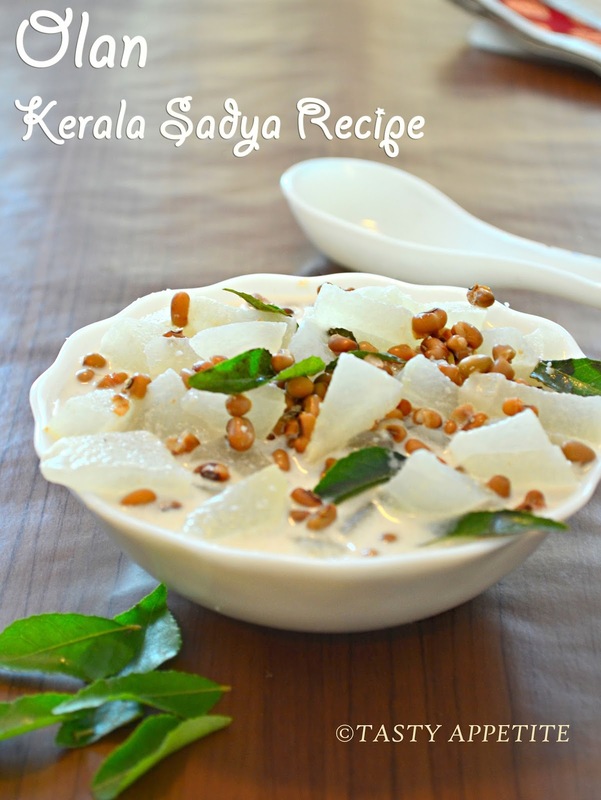 A must for any Kerala style sadya including Onam. 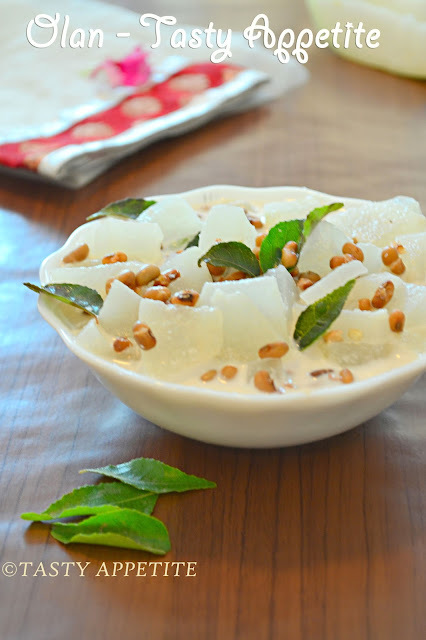 Happy Onam to you ! Jay, happy onam to you. olan looks delicious. Lovely color of this curry. Delicious and comforting recipe. Happy Onam to you and your family. Delicious olan ! Belated Onam wishes !